We’d love your help. Let us know what’s wrong with this preview of What We Set in Motion by Stephanie Austin Edwards. To ask other readers questions about What We Set in Motion, please sign up. Southern fiction is one of my favorite genres and I'm thrilled when I find a new to me author in this genre. I met Stephanie Edwards at the Pat Conroy Literary Center in Beaufort, SC, where she is a docent. Because she met Pat in high school, she had lots of great stories to share about him. As with all readers, our discussion soon turned to books that we both enjoyed and I found out that she had her first book on display in the shop so I bought a book and I loved it! The writing is so well done Southern fiction is one of my favorite genres and I'm thrilled when I find a new to me author in this genre. I met Stephanie Edwards at the Pat Conroy Literary Center in Beaufort, SC, where she is a docent. Because she met Pat in high school, she had lots of great stories to share about him. As with all readers, our discussion soon turned to books that we both enjoyed and I found out that she had her first book on display in the shop so I bought a book and I loved it! The writing is so well done that I found it difficult to believe that this was her first novel and I hope that she continues to use her talents to bring us more books in the future. The story begins in the 1970s when Nadine is about to graduate from college. Her goal is to go to NYC with her boyfriend (an actor) and pursue a career in dance. Her father, a rich controlling man in Beaufort, SC, forbids her to go and ties are cut between them when she moves to NY. In NY, she finds life much more difficult than she anticipated - it was almost impossible to find a decent apartment or a waitressing job to pay the bills while she took dance classes. This is a real coming of age novel with a brave and determined heroine. I loved Nadine and her determination to succeed despite the set backs. I laughed with her and cried with her. She is a character that I won't soon forget. Here is a hopeful "coming of age" journey for the main character, Nadine. Though there are challenges that someone less determined or less bold might never overcome, you root for this young woman as if she were your own young relative or friend. The story is an inspiring reminder of what it means to be full of life and passionate about the things you most value. The book moves quickly, as it draws you into a colorful and satisfying narrative that unfolds in two very different worlds. Read it over a weekend. Although not a thriller, I couldn't put it down. Enjoyed the characters and Nadine's story, a young woman who leaves the security of her home in the lowcountry to pursue a career in dance in New York City. The settings and the characters are familiar and realistic as well as the heartaches and achievements she experiences. A good read, I recommend it. Loved it from start to finish. As the author spent over 20 years in New York City as a dancer, it begs the question as to whether at least parts of this are autobiographical. A thoroughly engaging story of a young girl's determination to fulfill her dream of dancing professionally in the big city, you will enjoy going along for the ride. It is notable that this is Edwards' debut novel and I would think surely we will see more by this author. An interesting and satisfying story with a strong and Loved it from start to finish. As the author spent over 20 years in New York City as a dancer, it begs the question as to whether at least parts of this are autobiographical. A thoroughly engaging story of a young girl's determination to fulfill her dream of dancing professionally in the big city, you will enjoy going along for the ride. It is notable that this is Edwards' debut novel and I would think surely we will see more by this author. An interesting and satisfying story with a strong and lovable heroine. Stephanie, a former dancer and Broadway Costumer, is a writing teacher, novelist and consultant. After attending public school in Beaufort, SC, and college in California, she had a twenty-two-year career in New York Theater. She has worked with such talents as Liza Minnelli, Michael Jackson, Lauren Bacall, Woody Allen, Martin Scorsese, Hal Prince, Stephen Sondheim, and Michael Bennett. When not wr Stephanie, a former dancer and Broadway Costumer, is a writing teacher, novelist and consultant. After attending public school in Beaufort, SC, and college in California, she had a twenty-two-year career in New York Theater. She has worked with such talents as Liza Minnelli, Michael Jackson, Lauren Bacall, Woody Allen, Martin Scorsese, Hal Prince, Stephen Sondheim, and Michael Bennett. When not writing, she can be found shagging or cruising down the river with her husband Paul Coffman. 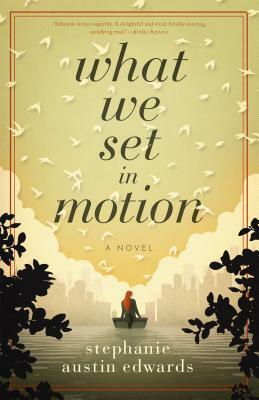 Her novel, What We Set in Motion, won a Best Submission Award at the Atlanta Writer’s Club Conference and a Gold Award for cover design from TheBookDesigner.com.